Drizzled Chocolate - Choose a contrasting colour of chocolate to drizzle from side to side across your fruit. After melting the chocolate, pour it into a piping bag and get drizzling! Gold Leaf - Undeniably luxurious in appearance, though quite expensive per sheet (for UK readers, I purchased mine at Waitrose). Depending on how many sheets you have, options include concealing the entire strawberry, or just the tip. Alternatively, you could create a small cluster of 23ct gold leaf in the centre of the fruit. Warning: gold leaf will stick to everything and anything!! I used a cocktail stick to position it, and my fingertips to press into place. Flakes - Coconut, chopped nuts, sugar crystals, chocolate curls etc. Not only does it create a gorgeously thick, 3D effect, it's also ideal for those with less-than-steady hands! Caramel - Along with drizzling chocolate from side to side, look at other ingredients such as caramel. Who could resist?! This is AMAZING. I love the ideas! These look sooooo good Gabs! I’m coming over right now haha I love all the different variations you’ve come up with. You must be the ultimate hostess! I didn’t realise edible gold sheets were so expensive though - but I’ve never bought them in-store before. Have you check online? I know they’re really cheap in Thailand so maybe you could find some on eBay or something then make a massive bunch of gold covered food! Hahaha, ok, now I’m getting carried away.. I bought the gold leaf in store, but i'll definitely check online first from now on - thanks gorgeous! 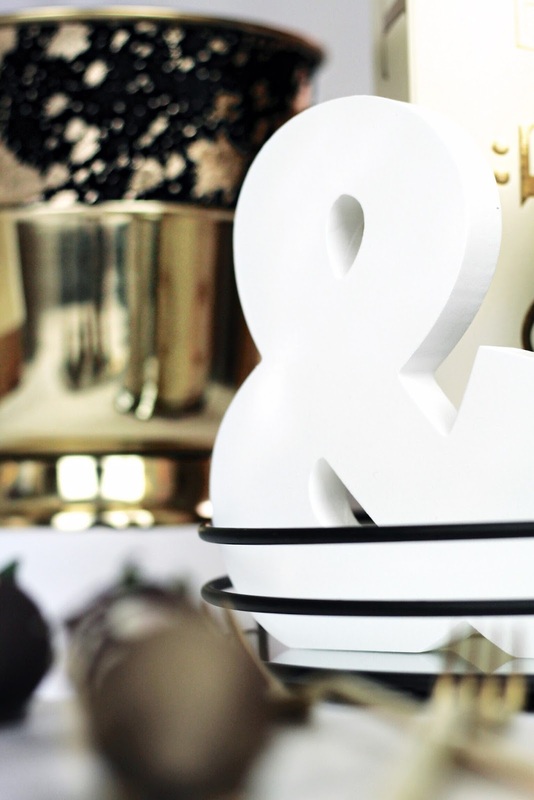 What a gorgeous entertaining idea Gabrielle! These look so festive and elegant at the same time and would work for impromptu get togethers as well more formal occasions. 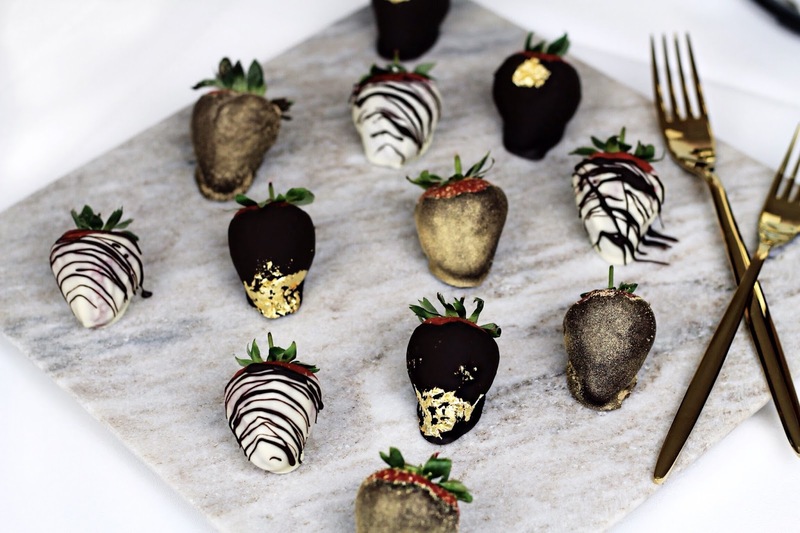 These look so impressive, especially with the gold leaf and the white chocolate with dark chocolate drizzle! I mean, I'd eat them without any chocolate on them, as well as with all the flavour combinations you mentioned so I'd be happy no matter what. They look amazing, but with two kids around no strawberry survives long enough to be decorated. The second they spot them into the belly they go. They look almost to good to eat! Its my partners birthday coming up and I've booked a hotel... Shall be making some of these to take with me! oh my gosh these are so amazing! I want to eat them rn! These strawberries actually look to pretty to be eaten haha! I've always wanted to get edible glitter and have fun decorating cakes and all that, but never seen to find the time for that. 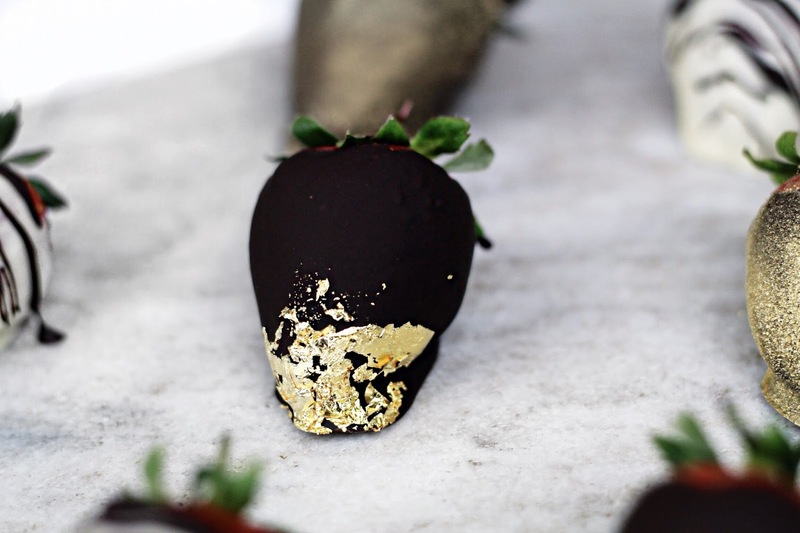 Drizzling the strawberries with caramel sounds perfect, and of course the gold leaves make it all so special. 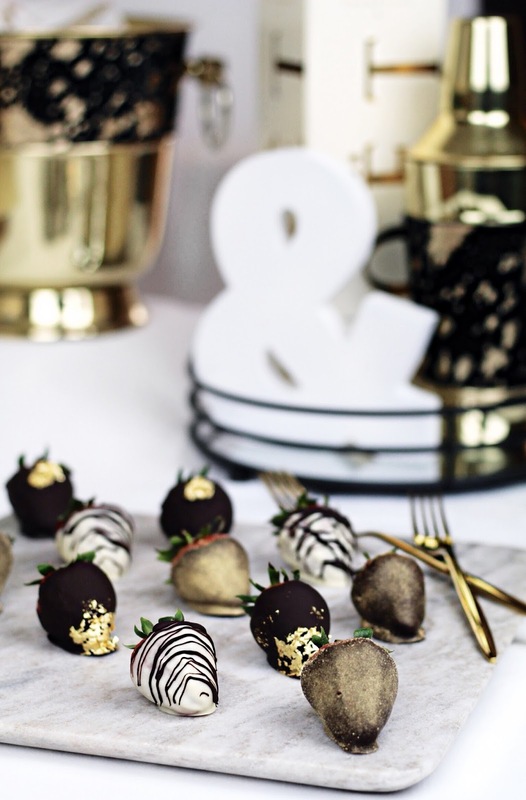 That would be a great new year's eve treat, with all the gold and rich chocolate goodness! Hi Dear, how are you? I haven't be here in a long time! The little one is keeping me busy. I totally love the way you decorated these strawberries. They look gorgeous and so yummy. Hey babe! So, so lovely to hear from you, hope you and your miniature-version are doing really well! They look too pretty and luxury to eat!!! Well, I still want to eat them though lol Great job girlie! Wow this looks so nice and fancy ! These are too beautiful to eat! What a fun way to class up chocolate covered strawberries! This is amazing and looks like you spent eternity making everything look so drool and picture worthy! I have never used gold leaf before, mainly because the price puts me off. 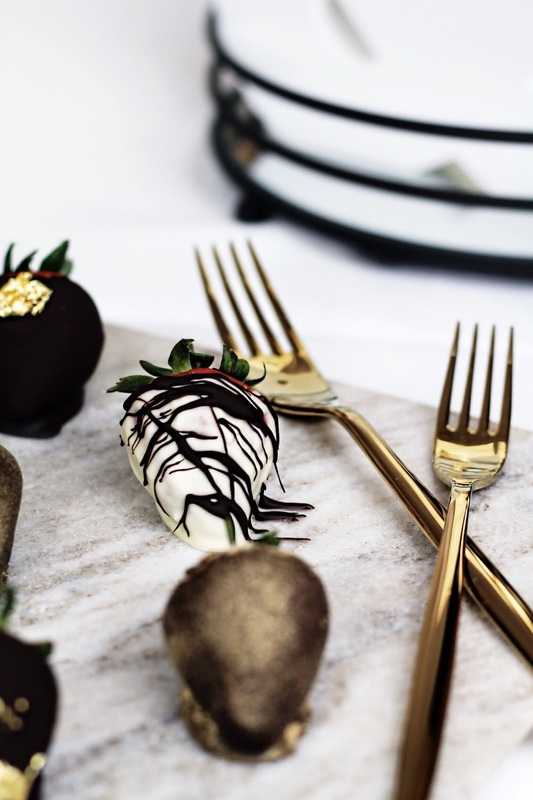 I have never decorated desserts with gold leaf, but now I want to! These strawberries look amazing! Thanks for sharing! All other chocolate strawberries are forever ruined. These are just beautiful! And love how you incorporated gold leaf into them! These strawberries look absolutely gorgeous. Those strawberries are amazing! I am super excited to know that I can buy edible glitter, and I can't wait to try my hand at creating those elegant treats! These look so great!! I could totally imagine them at a super posh wedding or birthday party. Great post!! These look so gorgeous! Your photography is always on point Gabrielle! What a lovely idea - they look absolutely gorgeous and so luxurious! Have a nice weekend, Gabrielle! These look so good! They look so expensive! They look absolutely stunning Gabrielle! A joy to look at and delicious to eat. I will definitely try this. Love the different options. These strawberries look absolutely amazing! I'm in awe! Will have to try this myself! Ideal for a dinner party! You are a truly artist. Those strawberries look so beautiful that they deserve not to be eaten. Great job! wow! these are so gorgeous! Almost too pretty to eat! They look so pretty and glamorous, what a chic dinner party it would be! I need to try this. I have some strawberries and chocolate in the fringe. I was planning on doing some baking, but now I'm thinking why not leave it for tomorrow and try this today? Oh, my goodness. These are just fantastic. Oh, so mouthwatering. Omg, I love this so much! I make chocolate covered strawberry often, but I never really thought of decorating it. But with gold?! Yes please!! This post certainly caught my eye, chocolate is one of my favourite things as I'm sure you know. 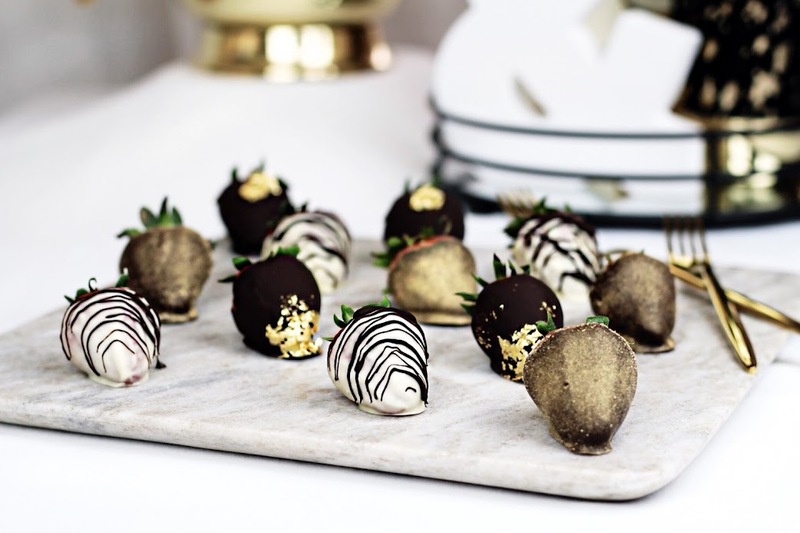 These tasty treats are styled beautifully and love the touch of the gold leaf, anything adorned with golden sparkle adds luxury to anything. 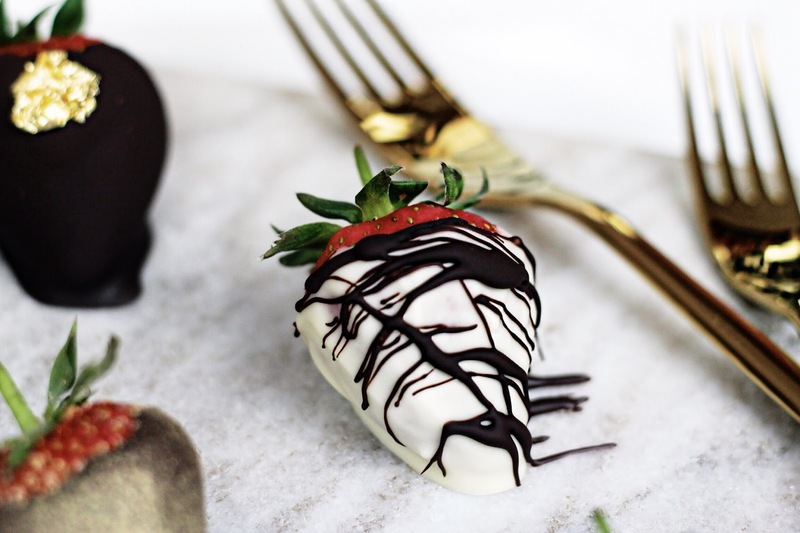 Strawberries are by far one of my favourite fruits and topped with this delicious chocolate, who can resist. A wonderful post and drool-worthy images! Ah this is such a lovely post! 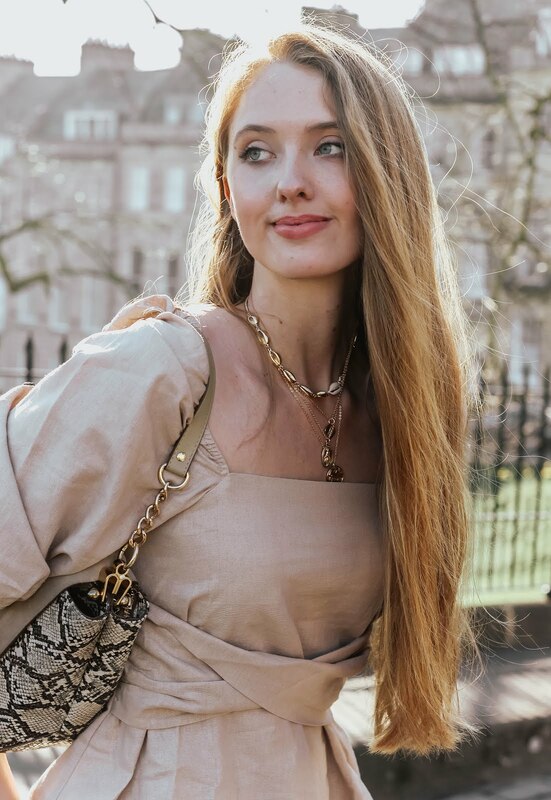 I am in love with your posts and photography, everything always looks so beautiful so chic and just luxurious!! !